Elysium Pre-Release Starts on 5/14 at The Wandering Dragon! Come on out to The Wandering Dragon starting on Thursday, May 14th to pick up the highly anticipated game Elysium, two weeks before the official release date! Not only that, but while supplies last, get a Bonus Pack of Promo Cards with each purchase! Throughout BGG.CON 2014 and shortly afterward, I had many people ask for my favorite game from the show, and as is often the case at cons my answer was not even on their radar because I tend to play prototypes of games due out in the near future. I’m the news guy, yes?, so I need to be looking ahead, eyes on the horizon, no longer concerned with those games freshly on the market that everyone else is playing and enjoying. I’d say it’s a rough life, but I doubt that anyone would believe me. The gist of Elysium is that you’re trying to earn the favor of Olympians by building strong legends, with the legends being comprised of characters from Greek myth. In each of the five rounds of the game, you’re going to claim three characters from the central playing area by using your colored tokens; each character card has one or more colored circles on it, and to claim the character you must give up one token matching one of those circles. With the fourth colored token, you take one of four turn order markers, with the marker giving you a set amount of gold, victory points (VPs) and transfers; more about the transfers later. If you can’t use a token to claim a character (because none of your tokens match the characters on display), then you take a citizen — that is, a face-down character card. Citizens have no abilities and can cost you VPs at the end of the game, but they can still be useful. If you can’t use a token to claim a turn order marker (again because none of your tokens match the markers still available), then you’ll go last in turn order next round and receive only a pittance of gold and transfers. You want to avoid this, if possible, but you’re torn in multiple directions each round with only four tokens available, so sometimes you just take the hit. Each character has different abilities, and you’ll ideally combine these abilities in good ways to earn gold and victory points. My cards above, for example, might not seem ideal at first glance — the one on the left with the little snake icon can’t be used unless I hold another snake card in my domain, and the one on the right relates to getting and using citizens, which is the failsafe option on a turn and not something you probably want to plan for — but it was the first turns of a game I had never played, so I was winging it and hoping for the best. Some characters have an instant ability, some an ongoing one; some can be tapped once per round, some have a one-shot use whenever you deem it best; and some affect only the endgame scoring. If you’ve played a few games, then you’ll probably be familiar with the types of options available on them. To earn victory points, you need to give up your characters — that is, transfer them from your domain to your elysium, a.k.a. the Elysian Fields that served as a place for mortals deemed favorable by the gods to go after they died. The trick is that once you place a character in your elysium, you can’t use its power any longer. Thus, you want to put together an awesome combo engine on the fly during the game while simultaneously dismantling that engine along the way. You can transfer a character to your elysium only at the end of a round or if a special power allows you to do so. As you do, you start a new legend or add to an existing legend, with each legend being cards of the same value or from the same faction. The larger the legend, the more points it’s worth at the end of the game. Cards are numbered 1-3 and come from eight factions (with only five used each game), and you need to pay 1-3 gold each time that you transfer a character. You can’t repeat a character in a legend, so throughout the game you’re trying to draft both characters that can prove useful in the early going while also allowing you to score them later. Once you have two characters in a legend, you can then transfer a citizen to it as a joker. Bonus tiles are available for legends, with each value having a bonus token that works akin to Catan‘s longest road bonus; once you have two characters of the same value in a legend, you claim the token and you’ll hold it until someone has more characters in a legend than you do. The bonus tokens for factions are first come, first served, with the player who first puts together two cards from the same faction earning five points and the next player earning two. As you can tell from the image above, I racked up a fair number of bonuses, but no one else seemed to be concentrating on faction legends, so I picked up three of them, in addition to one other bonus. Victory! Elysium combines lots of stuff that I love in games: drafting, card combos, a mini-game of “chicken” as you try to float a card for pick-up on your next turn, and the challenge of a new card layout each round that forces you to adapt on the fly. This latter bit is perhaps the most enticing thing, something I dug in Colors of Kasane, too, for example: Over the course of the game you’re going to have only fifteen characters. That’s it! From the layout of 3n+1 characters each round, you get at most three of them, so at the start of the round you eyeball them all for powers you want and the mix of colors required to get them. Here’s who I want first, but I’m going third in the round, so here’s the back-up first choice. Ah, but you took that one, leaving only one other yellow character available in addition to the yellow turn order marker. One of us is going to lose out on yellow — but can I afford not to take that character now? Will it still be there for me? What is everyone else collecting, and so they have supporting characters to make that one matter to them? Each round is a mini-game, with everything building up and being torn apart at the same time. You face off against your fellow citizens while also confronting the whim of the gods, who constantly challenge you anew. Looking forward to trying this one again! Elysium is the next game from Space Cowboys – the relatively new publisher who released the excellent (and SdJ nominated) Splendor. During Elysium players are all demi-gods, competing to be the best and earn their way into legend. The game is played over 5 rounds and the player with the most victory points (VPs) is the winner! There are 8 sets of god cards in the game – each for a different god. Whilst the cards within each set are different, the abilities of each set of cards have a common theme; for example, one god’s cards are about generating money, etc. Each game is played with 5 of the 8 sets, so this will give variety in replay, especially as 2 of the sets add extra rules too. The cards’ abilities are described by icons, but there is also a small amount of text to assist too which is unobtrusive. As well as the (god) set it belongs to, each god card has the number 1, 2, or 3 on it too which are important when scoring at the end of the game. At the start of every round, each player starts with 4 coloured tokens (red, blue, green and yellow). On your turn, you can claim any one of the cards or turn order tokens if you currently own the coloured markers that match those shown on the card, i.e. 1 yellow marker, or 1 green plus 1 other colour marker. After claiming the card, you can discard any one of your coloured markers, not necessarily the one that was used to claim it, so you could use your blue marker more than once but at the expense of a different colour being discarded instead. You have to claim a card with a matching marker if you are able to; however, if you don’t have markers that match any of the cards then you still take an item but you must turn it face-down. Face-down god cards show a god turning its back on you – these cards are usually unhelpful, but a few god cards do interact with these and they can be used to assist scoring at game end too. Face-down turn order cards give you the same turn order number but the money and promotion effects (explained below) are worse. So, the claiming of god cards and turn order each round is a race to grab what you want before others do. However, there’re also a lot of interwoven decisions to be made as you need to work out what cards you’re actually able to take due to the colours you have remaining, what items will combine/score well together, what cards other players are after so might take before you, and so on. You can grab a turn order marker as your first action, but that means many of the god cards may be gone before you get to take your first one, or you can focus on gaining god cards but you may not like the turn order marker(s) you are left with. Many of the god cards give benefits based on other god cards you have too so there is some interaction between them. At the end of the round, players get the gold and promotions marked on their turn order cards; for example, 1st in turn order gets 5 gold and 2 promotions, whereas 2nd gets 3 gold and 3 promotions (less if they’re face-down). Each promotion lets you move one of your god cards from above your player board to below it (costing gold as well) which means the god card will count towards scoring but the ability of the god card can no longer be used. So, you also need to balance moving cards that give you powers against scoring. Moving god cards to below your player board repreesents them moving to Elysium. The main scoring happens at the end of the game in several ways. Players get VPs for sets of coloured god cards (a set being 3 cards of the same colour each numbered 1, 2 and 3), for having multiple different coloured god cards, and for the relative number of helmet markers compared to the other players. Players can use the god cards that are face-down (showing the god’s back) to make up sets for scoring but each one used this way costs 2 VPs; however, at least they are a little help. There seems to be a lot to think about in Elysium. Not only do you need to gain god cards that will work well together but timing is also important. As the round progresses, you will have fewer and fewer coloured markers so your choices will become more limited. Also, there should be some opportunity for denial play as players can take items on purpose so their opponent(s) have nothing left they can claim without turning them face-down. The timing of when to promote cards (move them into Elysium) should be an interesting decision too. I’m sure you’ll want to keep your abilities but then moving cards so they will score is limited so you can’t wait until too long. 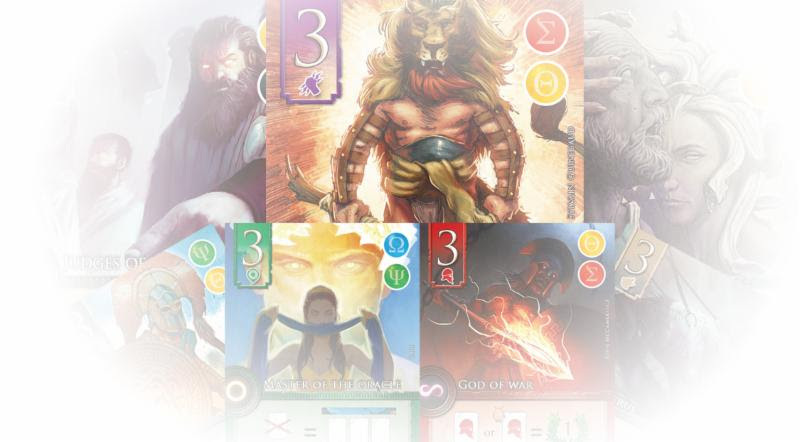 8 separate artists have created the artwork for each of the sets of god cards, including the artist from Splendor. The art on the god cards does look very impressive.